This tour offers awe-inspiring vistas only a short trip from Denver. From the comfort of our van, your guide will take you to a beautiful mountain town. 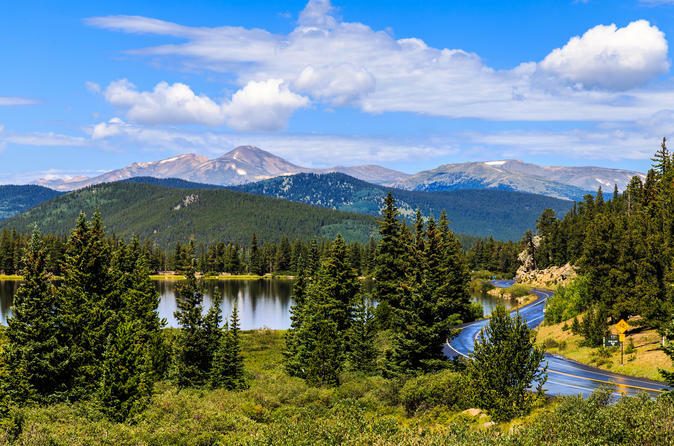 Travel along a scenic road along Mount Evans. Stop at Red Rocks Amphitheater, one of Colorado’s most spectacular attractions. Enjoy incredible views throughout the entire day. Fully customized to your group's needs. Begin your day with pickup from your hotel. Then visit to one of the best outdoor music venue’s on earth, Red Rocks Amphitheater, where music has echoed off the sandstone cliffs for decades. Drive through Morrison on your way up into Bear Creek Canyon and watch the landscape change as you head up into the mountains. During summer, head to the top of Mount Evans, (14,265) for an incredible adventure not ideal for people with fear of heights. In the winter, take in sweeping vistas and the clear waters of Echo Lake, as you continue along on your journey passing though a Wild West town before heading back to Denver. Summer: June through September. On Sept. 5th the top 5 miles of Mount Evans will be closed. Elevation reached 12,800'. Winter: October 10 through May. The tour will drive along the foot of Mount Evans and stop at a scenic mountain lake. Additionally the group will stop in a charming historic mining town.